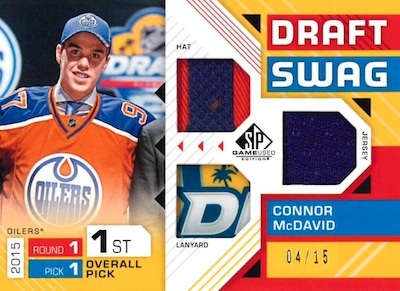 Known for its memorabilia offerings and rare base cards, 2018-19 SP Game Used Hockey is a hit-based NHL release with a strong brand past. 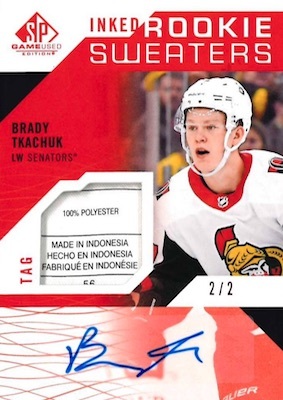 Similar to 2017-18, every Hobby box averages 4 hits with at least one being an autograph or premium memorabilia card. 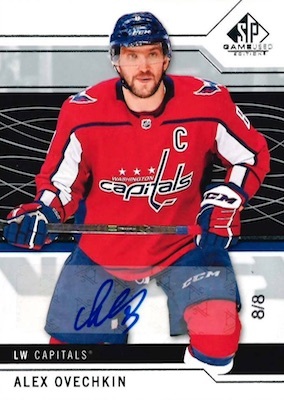 Treating base cards a little differently than most of the other NHL sets, the 2018-19 SP Game Used Hockey checklist caps the 100-card base set and 100-card Authentic Rookies subset print runs at the individual player's jersey number. In fact, the final card in the print run is a signed one-of-one edition. 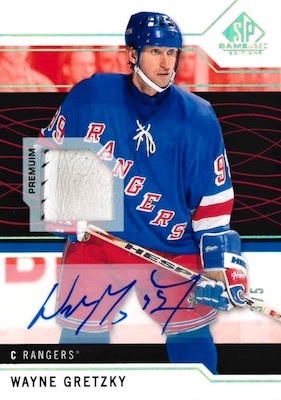 On the other hand, parallels are more plentiful and include autograph and relic versions. Mirroring the base set, many of the parallel amounts are unique to the player. 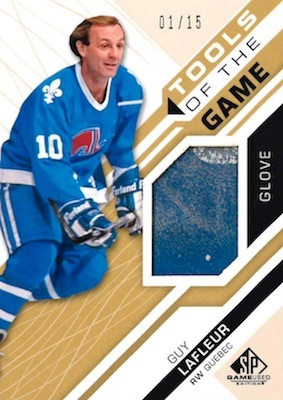 For instance, the Base Orange Rainbow parallel for the base set starts with 100 copies and then adds to that the most goals scored by the player in a single season. Likewise, the Authentic Rookies Orange Rainbow parallel begins with 100 copies, adding the draft year total to the amount. 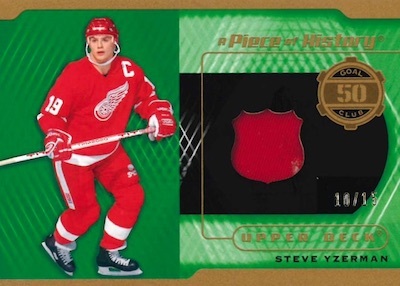 While many of the hits in 2018-19 SP Game Used Hockey only display memorabilia, there are several signed sets available, as well. 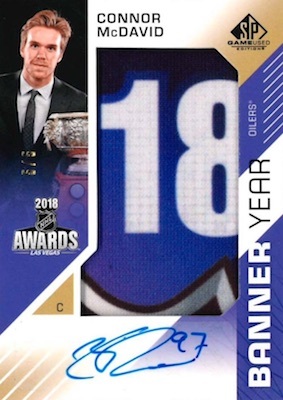 Banner Year features numbered autograph parallels via 2018 NHL All-Stars and 2018 NHL Winter Classic, plus the NHL Awards and NHL Draft options. Collectors can also find a fresh batch of Draft Day Marks cards for Veterans (#/10 per letter) and Rookies (#/35 per letter). 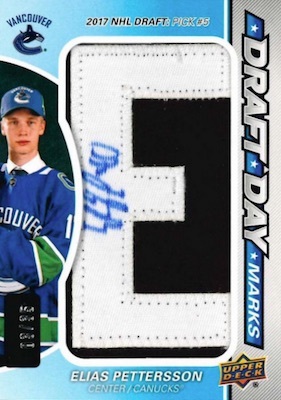 Another letter-based insert is Signature Day Marks (#/35 per letter). 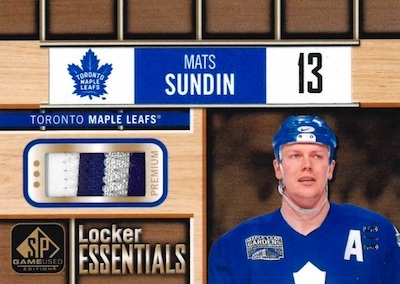 In addition, Inked Sweaters (#/99) is joined by Patch (#/15) parallels, as well as limited Inked Rookies Sweaters Patch (#/49) and Tag (#/2) cards. 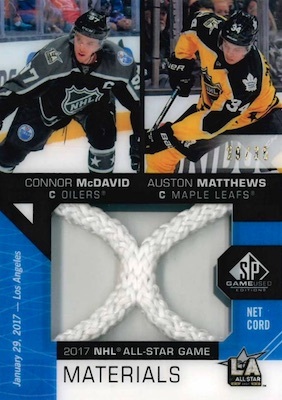 Touching on many of the NHL events throughout the year, 2018-19 SP Game Used Hockey casts a wide net for memorabilia, and that even includes game-used net pieces. New relic inserts are found in A Piece of History (#/99), Battle Lines (#/35), Draft Swag (#'d), Locker Essentials (1:6) and Tools of the Game (#'d). Among the returning lines, 2018 NHL All-Star Skills Fabrics (1:3) comes in Relic Blends (#/125), Duals (1:20), and Quads (1:120), with low-numbered Patch (#/35 or less) and Tag (#/3 or less) parallels. Similarly, 2018 NHL Stadium Series Fabrics (1:14) has Quads (1:120) and accompanying parallels. 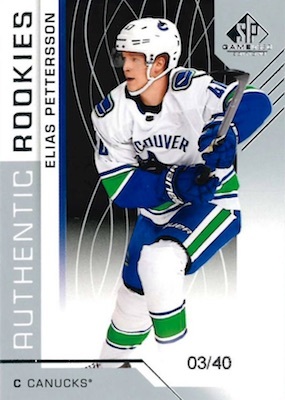 2018-19 SP Game Used Hockey also has the unique Frameworks cards at 1:12 boxes. Centered around event memorabilia, Banner Year offers 2018 NHL All-Star Game (1:12) 2018 NHL Winter Classic (1:16), NHL Awards (1:26) and NHL Draft (1:10) sets. Although veteran relics are a huge component, first-year talent is highlighted in Rookie Sweaters (#/199) and 2018 Rookie Relic Blends (#/125). 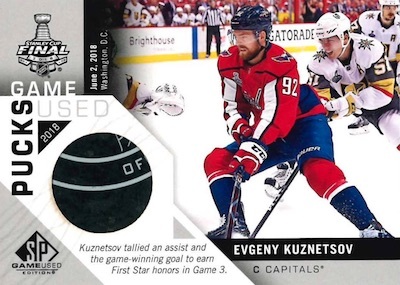 Another focus for SPGU in '18-19, the tough Game-Used Pucks insert includes 2018 NHL 100 Classic, All-Star Game, Stadium Series, Stanley Cup Final and Winter Classic themes, each at 1:720 boxes. The aforementioned net cords are featured in 2018 NHL 100 Classic, Stadium Series, and Winter Classic Material Net Cord. 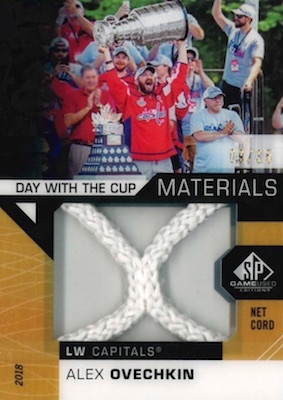 Each numbered to 35 copies, there is also a special The Day with the Cup Material Net Cord set. 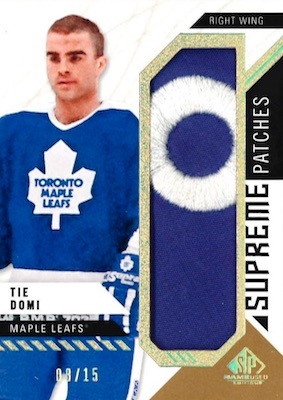 If that is still not enough, 2018-19 SP Game Used Hockey incorporates the familiar Supreme Patches (#/15) and Game Gear (#/6) relic sets. CARD PARALLELS: Orange Rainbow #/299 or less, Green Storm 1/1. ROOKIE PARALLELS: Rainbow #/299 or less, Orange Rainbow #/299 or less, Snowstorm #/5 (Unannounced), Green Storm 1/1. 156 cards. 1/1. Hobby only. Overall base odds - 1:7 packs; Authentic Rookies - 1:5 packs. Overall base odds - 1:20 packs; Authentic Rookies - 1:12 packs. Overall base odds - 1:4.5 packs. Buy 2018-19 SP Game Used NHL autographs on eBay. 33 cards. Serial numbered #/35. 26 cards. Serial numbered #/49. 2 cards. Serial numbered #/35. Unannounced. Serial numbered #/30. Full guide and gallery. 10 cards. Serial numbered #/35. Overall odds - 1:2.5 packs. PARALLEL CARDS: Patch #/35, Tag #/3. Overall odds - 1:20 packs. 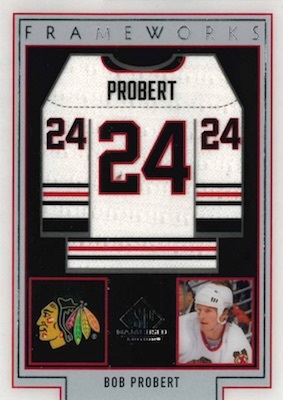 PARALLEL CARDS: Patch #/25, Tag #/2. Overall odds - 1:120 packs. PARALLEL CARDS: Patch #/10, Tag 1/1. 34 cards. Serial numbered #/6. 44 cards. Serial numbered #/125. PARALLEL CARDS: Jumbo Patch #/15. Overall odds - 1:14 packs. 10 cards. Serial numbered #/6. 13 cards. Serial numbered #/35. 23 cards. Serial numbered #/125. 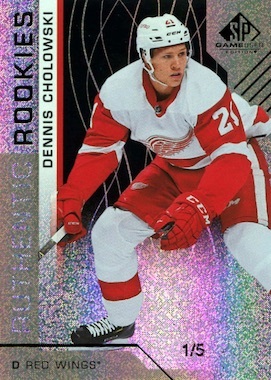 PARALLEL CARDS: Patch #/15 (No Iginla*). Overall odds - 1:6 packs. 113 cards. Serial numbered #/15. 29 cards. Serial numbered #/199. View the 2018-19 SP Game Used Hockey checklist spreadsheet. Way too many inserts and variations! Also some of the relics and swatch cards are cheap looking, no foil, poor designs. The serial numbered cards use ink jet printed ink #’s rather than foil stamps. Who really wants Banner relics? This set has a lot of junk filler cards that are not even relative to the current year players and draft class. This used to be a good product but someone has let this thing go out of control. and finally please NO MORE STICKER AUTOS????? I’ll take a redemption….I don’t mind the wait, its liike getting the card twice. It’s truly a hit or miss, on a box by box basis, with this product. I’ve had some very good boxes (for example, with a patch card and a net cord card) but I’ve also had some bad boxes, (for example, with a low tier vet sticker autograph and a couple of player worn rookie stuff). I wish that SPGU was more consistent, but it truly is a gamble. I would recommend giving it a try or two, if it fits within your budget.